The main difference between id and class in CSS is that the id is used to apply styling to one unique element while the class is used to apply styling to multiple elements. CSS consists of a set of rules. The browser can interpret these rules and apply them to the specified elements in the document. 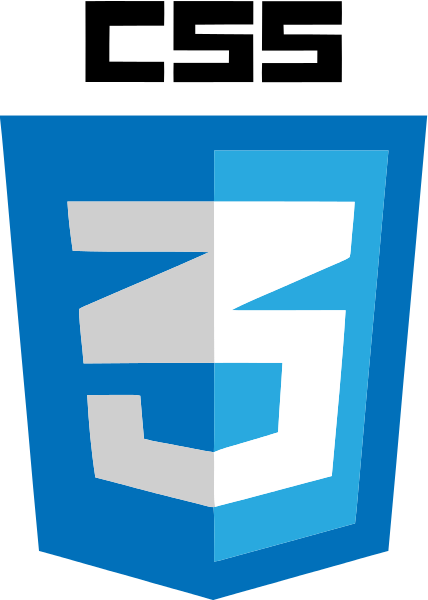 A CSS style rule consists of three sections. They are the selector, property and value. Declaration refers to the combination of property and value. They appears inside a pair of curly braces as follows. Property – An attribute. All HTML attributes are converted into CSS properties. Some examples are color, text-align, border, etc. Value – Value is what is assigned to the property. For example, blue can be assigned to the property color. The programmer can define a style rule based on the id of the elements. All the elements with the same id will be applied with the defined style. To select an element with a specific id, there should be a # (hash) symbol followed by the id of the element. Assume that the HTML file contains a statement as follows. CSS file contains the following piece of code. When the browser interprets the HTML statement, it checks the id of h1 element, which is header1 in the CSS file. Then, it applies the defined CSS rule to the h1 element. Therefore, the text Hello World will appear in color blue. The id is unique within the page. Therefore, the id selector is used for one unique element. Similar to the id, the programmer can define the style rules based on the class of the element. All the elements with the same class will be applied with a defined style. To select an element with a specific class, there should be a . (period) symbol followed by the name of the class. Assume that the HTML file contains the following statements. When the browser interprets the HTML statement, it checks the class of h1 element, which is header1 in the CSS file. Then, it applies the defined CSS rule to all h1 elements. Therefore, the text Hello World 1 and Hello World 2 will appear in color blue. It is possible to use the same class on multiple elements. Therefore, the class selector is used for multiple elements. 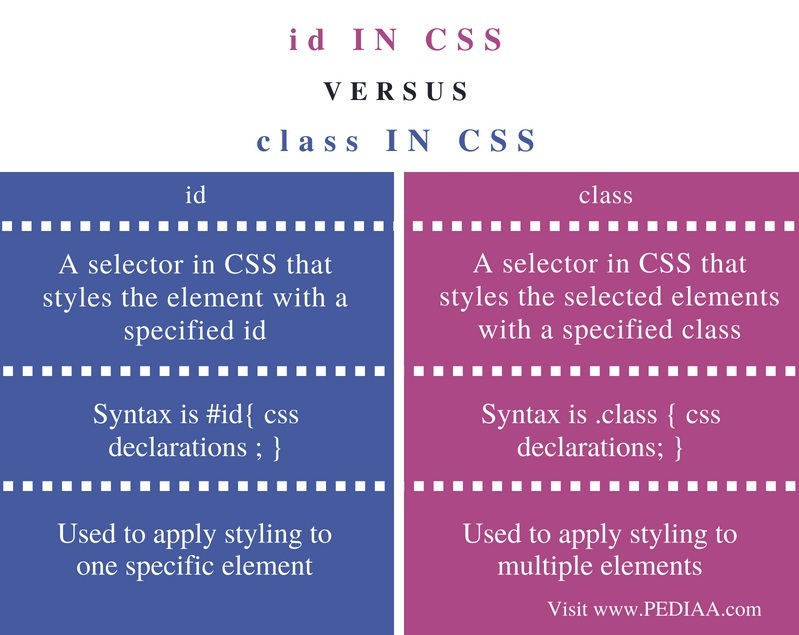 id is a selector in CSS that styles the element with a specified id whereas class is a selector in CSS that styles the selected elements with a specified class. Furthermore, the usage of id is to apply styling to one specific element. The usage of class is to apply styling to multiple elements. The id and class are two selectors in CSS that allows applying styling to the HTML elements. The main difference between id and class in CSS is that id is used to apply styling to one unique element while class is used to apply styling to multiple elements. 1. “CSS Syntax and Selectors.” W3Schools Online Web Tutorials, Available here.